Unfortunately, I don't know when this folded letter was mailed in Port-au-Prince. in Liverpool after its voyage across the Atlantic. The sender is J. Framooz & Co. in Port-au-Prince. Jacmel on Haiti's southern coast. Jacmel had been a packet agency since 1840. A British Packet Agency was established there in March, 1866. A British Caribbean feeder packet picked up the mail in Jacmel. then the Danish West Indies for the trip across the Atlantic. The procedure required that all mail be prepaid to its destination. the time, their use was not introduced at Port-au-Prince until 1869. I would have expected a British Post Office Haiti handstamp but there is none. where it received a square ship cancel on October 10.. 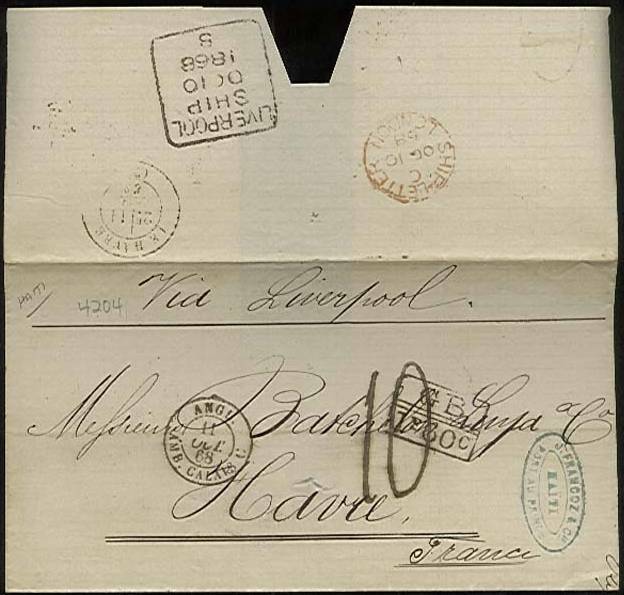 It went to London the same day where it was marked with a red SHIP LETTER cancel. It was rated in London and 1F 60c was credited to the account of Great Britain. The cover was then routed to an English Channel crossing from Dover to Calais. with an ANGL. | AMB. CALAIS cancel indicating its origin in England. It then proceeded to its destination in Le Havre where it arrived the same day. The 10 marking is the 10 c. credit to France for carriage from Calais to Le Havre. The pencilled HAITI and 4204 are dealer/owner marks.